Log into the website. 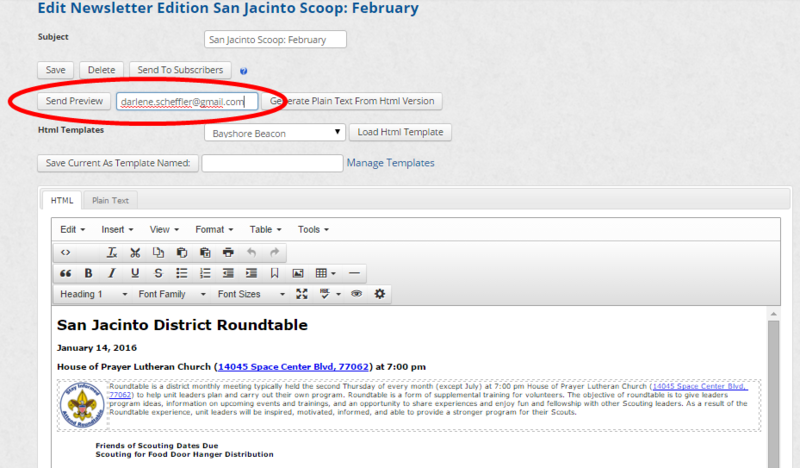 Under the Resources tab on your district website, click on Send a Newsletter. Click on View/Edit Drafts. Do not click on Add New Newsletter. Subscribing is a two step process. The subscriber has to first sign up for the newsletter (on the Communications page under Resources) and then reply to the email sent to them. If a subscriber has not responded to the email, they will be noted as unverified. You can resent them a confirmation email. You will likely want to delete unverified subscribers older than 90 days. There is a link to do this on the page. Give the Newsletter a Subject. Be consistent (e.g., Raven District Newsletter: March 2016 edition). You can copy articles from the Home Page. For the newsletter, you can put graphics in tables. This sometimes helps with alignment. Remember that you can't put graphics in tables on the website). Click on save frequently during the editing process. 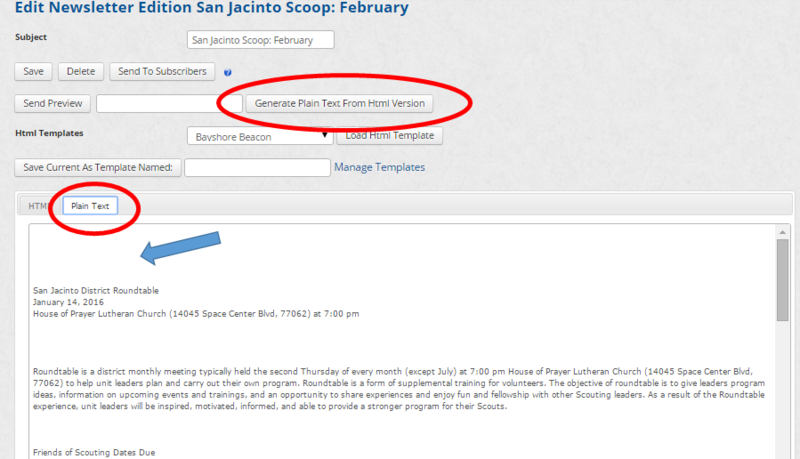 When you finished with your newsletter, click on Generate Plain Text from Html Version. Then click on the Plain Text tab. This is version sent to anyone that subscribed to receive plain text emails. Edit the plain text version. There will be large blank spaces where any graphics were located. Delete the empty spaces. If you copied articles from your home page or other pages on the district or council website, you will need to type our any hyperlinks and email addresses. 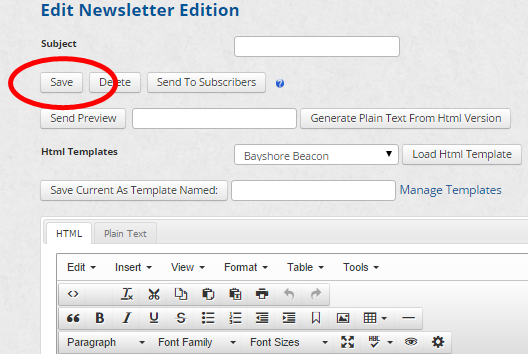 When your newsletter is ready, click on Send to Subscribers. 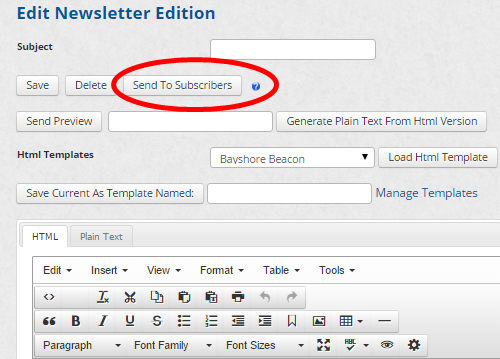 Note: If you did not generate the plain text and/or add #unsubscribe to the bottom of the email, the email won't send. 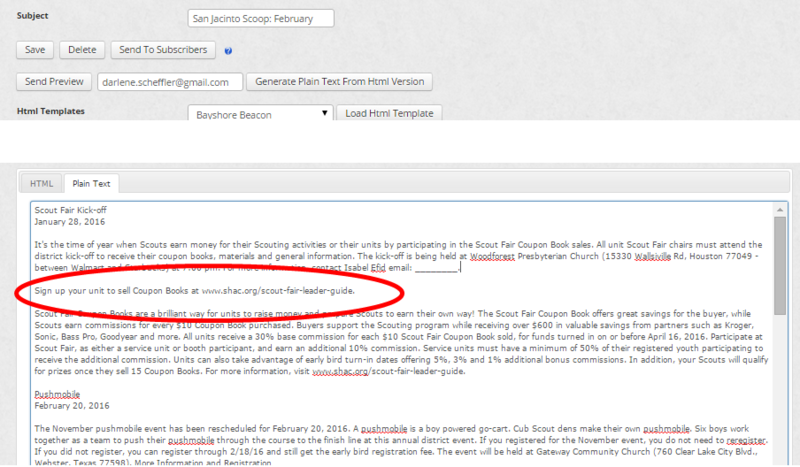 The newsletter must have the text #unsubscribe# at the bottom of both the HTML and Plain Text versions of the letter. The email will not send if you do not do this step. The system will replace this with a link to allow recipients to unsubscribe from the newsletter. Copying and pasting the newsletter. Frequently you will want to reuse most of your email for another newsletter. Click on < >. 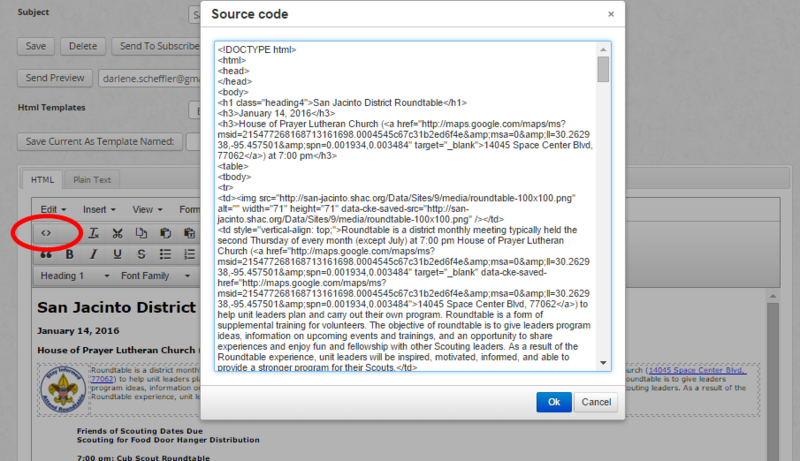 The Source code will pop up. Click Ctrl + A, and then Crtl + C. Then open a new newsletter. Click on < > and then Ctrl + V.